The City of Oakland will be ground zero for the first urban sensor network to provide real-time, neighborhood-by-neighborhood measurements of carbon dioxide – a greenhouse gas that contributes to global warming – and other air pollutants. The prototype network, being installed by chemists at the University of California, Berkeley, will employ 40 sensors spread over a 27 square-mile grid, most of them mounted atop local schools to engage students in the project. The information the network will provide could be used to monitor local carbon dioxide emissions to check on the effectiveness of carbon-reduction strategies now mandated by the state, but hard to verify. ABC7 (KGO-TV) reporter Carolyn Johnson interviewed Ron Cohen and Jill Teige about the carbon dioxide sensor network they are installing atop schools in Oakland. The state has committed to a cap and trade strategy as an attempt to lower carbon emissions, and the Bay Area Air Quality Management District instituted a carbon fee on regional businesses in 2008. But carbon taxes rely on reports by local agencies and businesses that estimate their emissions based on assumptions that may be wrong, such as the amount of carbon dioxide emitted when pouring concrete. 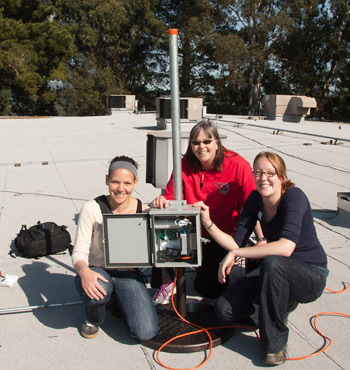 Built and installed by Cohen, Teige and their lab colleagues, the shoebox-size sensors will continuously measure carbon dioxide, carbon monoxide, nitrogen dioxide and ozone levels as well as temperature, pressure and humidity, streaming the information live to the Web through the site http://beacon.berkeley.edu. “One of my fantasies is that the local news will show a video of the day’s changing CO2 levels, just as it shows the movement of weather fronts,” Cohen said. UC Berkeley chemists plan to install sensors at schools on a grid stretching between the bay and the hills, and from San Leandro north to El Cerrito. 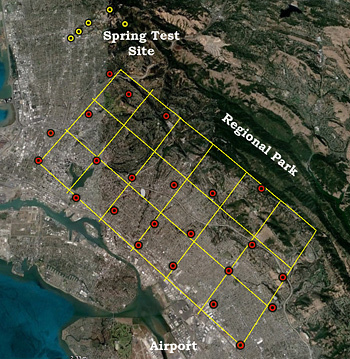 The sensor network, dubbed BEACON (Berkeley Atmospheric CO2 Observing Network), stretches from the East Bay Regional Parks on the east to Interstate 880 on the west, and from El Cerrito on the north nearly to the San Leandro border, encompassing open space as well as heavily trafficked areas. Most of the sensors are being mounted on the roofs of local schools, Cohen said, in order to get students interested in the connection between carbon dioxide emissions and climate change. 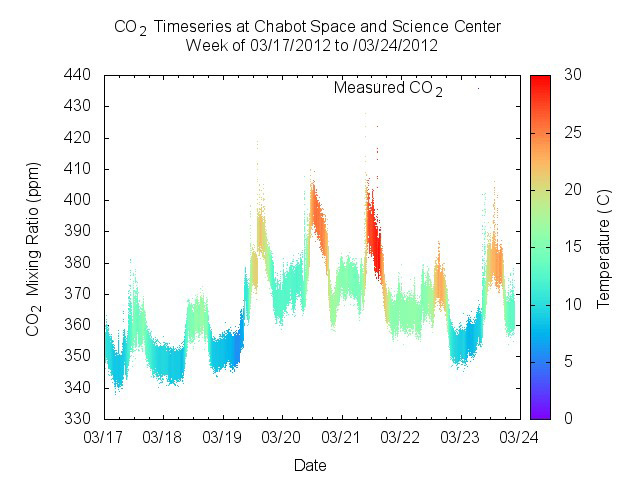 The UC Berkeley researchers work with Oakland’s Chabot Space & Science Center to create middle school and high school activities using live sensor data streamed through the Web as part of the students’ energy and climate science curriculum. “As students are instructed on greenhouse gases and global climate change, they will also see how the BEACON project can potentially influence national and global policy making,” she wrote in an email. Nine of the sensors are now in place at Chabot, the Oakland Zoo, two high schools and five elementary schools. Others are ready to install, pending approval by school officials. Two are reserved for the new Exploratorium in San Francisco, which is scheduled to open next year on Pier 15 and includes an exhibit on CO2 and climate change. The sensors could detect the fumes from a passing ship or the effects of a “Spare the Air” day, Cohen said. Cohen and his UC Berkeley colleagues have built refrigerator-sized monitoring equipment for years, each package costing up to $250,000, but providing exquisitely precise and detailed data. The new sensor packages cost one-twentieth as much because they make use of off-the-shelf devices, such as a nitrogen dioxide sensor identical to that found in industrial toxic gas alerts. The BEACON network is a pilot program funded by the National Science Foundation to determine what information can be learned from a densely spaced network. Lower cost means less sensitive instruments, but the precision should be offset by sheer numbers, Cohen said. 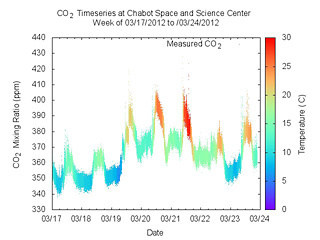 Carbon dioxide levels during a typical week as measured at Chabot Space & Science Center in Oakland. Levels peak at midday and midweek, and are lower on weekends. Teige noted that the current sensors will be placed about two kilometers apart. “How closely spaced these sensors need to be in an optimal network is still an open question that we intend to address with this pilot, before expanding the network to other cities and the entire Bay area,” she said. Each sensor is connected to the Internet, many of them wirelessly, so they can send measurements every five seconds to a computer in Hildebrand Hall on the UC Berkeley campus. Cohen and Teige hope to have all 40 sensors in place by the end of the summer, just in time for the opening of classes in local schools.